In 1971 former Beatle John Lennon wrote a letter of advice to aspiring folk artist Steve Tilston, and now, according to the Daily Telegraph, the contents of the note have been revealed for the first time. Lennon's letter to Tilston was in response to an interview he read in the now-defunct ZigZag magazine in which the then-21-year-old Tilston said he was worried that money and fame could impact his ability to compose quality material. "Being rich doesn't change your experiences in the way you think," Lennon wrote. "The only difference, basically, is that you don't have to worry about money - food - roof etc. But all other experiences - emotions - relationships - are the same as anybodies. 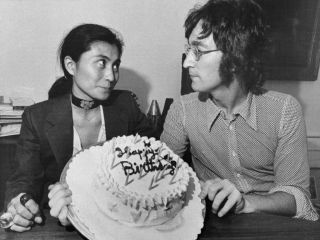 Lennon sent the letter to the office of ZigZag, but it never reached Tilston until five years ago, when a collector seeking to verify its authenticity contacted him. Tilston, now 60, who went on to record more than 20 albums during his career but never attained the level of fame that so concerned him at the time, said of Lennon's note, "I feel it was a rather brotherly letter really. Not antagonistic, just offering words of advice. If I had received it all those years ago my young self would definitely have rung him. I felt rather angry to start with to think that someone had just sold the letter rather than passing it on to me but you have to let these things go." Lennon's letter, which is estimated to be worth around £7,000, is currently in the possession of an American collector.